Every year Outreach Magazine publishes a list of the top Christian resources for leaders interested in outreach. The list is the “Annual Outreach Resources of the Year”. For this year’s list, we're pleased to announce that Conversion & Discipleship received an award for the resource of the year in the discipleship category. 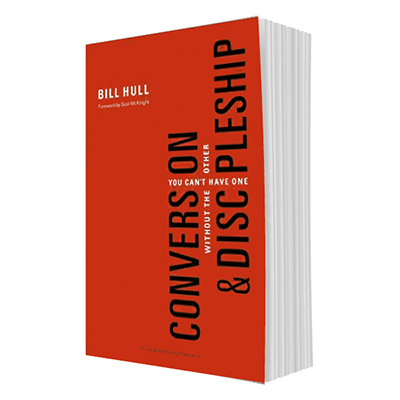 Get a copy of Conversion & Discipleship by clicking here. For this annual list, Outreach picked top resources by category based on hundreds of submissions from publishers and authors from November 1st, 2015 to October 31st, 2016. The panel chooses must-read resources for pastors and leaders alike. They select a book in twelve different categories: evangelism, church, leadership, cross-cultural, social justice, apologetics, culture, discipleship, counseling and relationships, Christian living, children, and youth. Their selection represents the most important ideas, strategies and trends for that category. This year, Brad Watson, the executive director of Gospel-Centered Discipleship and pastor of coaching and missions at Bread & Wine Communities in Portland, Oregon, evaluated books in the discipleship category. As a representative of Outreach, he selected Conversion & Discipleship: You Can't Have One Without the Other as this year's top discipleship resource for pastors and leaders. "I want people to read this book because it deals with the singular issue facing American Christianity right now: what gospel do we believe in? Dealing with this question is vital because the gospel we believe in will determine the kind of people we are. If we're going to love the world as Christ loved the world, then we need to be increasingly more Christ like. The extent to which we become more Christ like goes back to the gospel we believe and what it naturally produces. In Conversion & Discipleship we teach that all who are called to salvation are called to discipleship, no exceptions, no excuses. By aligning with the Gospel of Jesus, we align ourselves also with the core mission of Jesus. “In the end, my hope is that the reader will more clearly understand what it means to live as disciples of Jesus. Following after Jesus means we are called to make disciples who in turn make other disciples. It's about multiplication, not just reproduction." Outreach Magazine started in 2002 in response to the growing desire among church leaders for more resources on outreach. They provide through print and digital publications leading ideas, insights and stories for Christian churches who are interested in outreach. Their publications feature speakers, authors and leaders like Andy Stanley, Francis Chan, Craig Groeschel, Dave Ferguson, Rick Warren, Ravi Zacharias, Bill Hybels, and many others.